At the Santa Barbara SOL (Sustainable, Organic, Local) Food Festival last fall, I tried a sample of some kind of green juice from the Ascending Health Juicery stand. It was so tasty that I made a note to myself to find out where it came from and how I could get more. Then, of course, I promptly forgot about it until Juice Week! Thank goodness for Juice Week. The thing that caught my eye about Ascending Health Juicery this time is that owners Alfred Pomerleau and Deb Monroe aim to be affordable: their organic, raw, locally sourced juices go for $5 for an 8-ounce jar; $9 for a 16-ounce jar; or $16 for a 32-ounce jar. One of the ways they keep costs down (and demonstrate their love for the environment) is to collect and reuse jars. Ascending Health is a small-scale operation, which means their menu is slightly limited: they always have a choice of five different juices, whose specific ingredients change with the season. You have to email (ahjuice@verizon.net) or call (805-698-5443) before 6pm to order your juice, which is then pressed the following morning and delivered to your door between 8:00-8:30am. When I called Deb to place my order, she warned me that they make their juice “differently,” with minimal fruit (for minimal sugar) and special herbs that are meant to add healthy kicks. She actually described some of their most potent juices as “intense - not light and foo-foo.” Who likes foo-foo juices, anyway? Not this kid. The instructions said to drink the juice slowly, savor it, and “allow your saliva to begin the digestive process.” So for lunch, I slowly savored the Original Green, willing my saliva to start digesting it (though, honestly, I can’t speak for my saliva’s success in that regard). After dinner, I tried the Original Red instead of nomming on a leftover chocolate Easter egg, a decision for which I deserve to be congratulated. Both containers were filled to the brim, to the point that some spilled out when I opened the lid. So much juice! The Original Green tasted okay, like getting attacked by a firing squad of vegetables, but they’re throwing water balloons at you and it’s a hot day. The Original Red was a little sweeter and even a tad spicy – again, I blame the fenugreek. So they were intense, but not in an entirely untasty way. 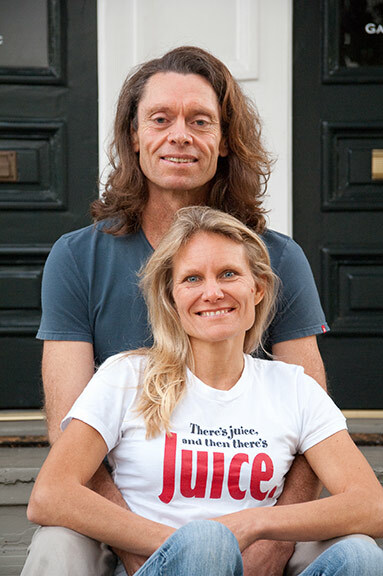 I’d argue that when it comes to juices, intensity = concentration; the flavor is a result of Deb and Alfred packing in as many vegetables as humanly possible. I can almost feel my health ascending!